A weekly blessing that I too often take for granted is a group of runners who, as the miles roll on, have become friends. We gather most Saturday morning at St. Andrew’s Lutheran Church at 7:30, in summer and winter. Some are always early, a couple are always late. We greet one another, teasing whoever has new shoes or jacket. Some stretch. Others debate what to wear or what route to run. Eventually we are out the door and the run begins. We always start the run together and kibitz about the past week. We joke that we are “running away from our problems.” Occasionally there is big news to share, a daughter’s graduation or the loss of a job. After a mile or two the group begins to break apart as the faster runners pull ahead. Over the years our runs seem to be shorter. The group started as a marathon training group, providing weekly long runs of 12+ miles. Now we rarely run more than six to eight. Last Saturday it was five. Participation has ebbed and flowed. We have had more than a dozen runners show up, but more often it is four to eight. In years past we had weekly e-mails, but now it seems to be texts and Facebook. The blessings come in the friendships. Not only do we hold each other accountable for our physical exercise, but we genuinely care about each other. 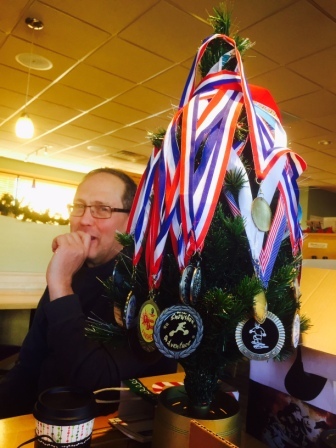 We celebrated when Mike Johnson completed twelve marathons in twelve months. In mid-December we gather for our White Elephant Gift Exchange where our zany personalities are in stiff competition to be creative. Jim McDonnell always wins the prize. The camaraderie came into clear focus this past year when one of our runners, Steve Libby, was diagnosed with pancreatic cancer in February and died in May. During his illness, we visited him or huddled up to pray before our morning run. We organized a prayer service for him and shared Libby stories. We grieved at his memorial service and we continue to remember the way Libby touched our lives. As we approach the start of 2016, I wonder what the year will hold. I will be starting my first interim ministry at Trinity in Lindstrom. I am contemplating hikes on the Superior Hiking Trail and the PCT. I hope to make a trip south to visit my daughter in Texas. And most Saturday morning, I plan to lace up my running shoes and join friends for a run. Upon reflection, I realize that we run not away from our problems, but towards love and peace. This entry was posted in love, Running, Uncategorized and tagged friendship on December 31, 2015 by Pastor John Keller. I always look forward to running with you John et al towards love and peace on Saturday mornings. Makes a great start for the Weekend.